A teacup on it’s own looks just darling (I use two on my dresser to hold my rings), but when you start to mix and match different patterns and pieces the results are stunning. They’re dainty and fanciful and make for a beautiful table setting. Personally I’m drawn to pastel colored teacups with flowers or gold accents….but you really can’t go wrong. I’m dying to fulfill this motto – so next on the agenda is to plan a spring “tea” party and fill these babies with Prosecco! Finger sandwiches anyone? ooh, becky! this is a sweet addiction! i need to start looking for them on my thrift shop stops! Beautiful! I want to start mixing matching mine and filling them with cute little jellys and mousse. 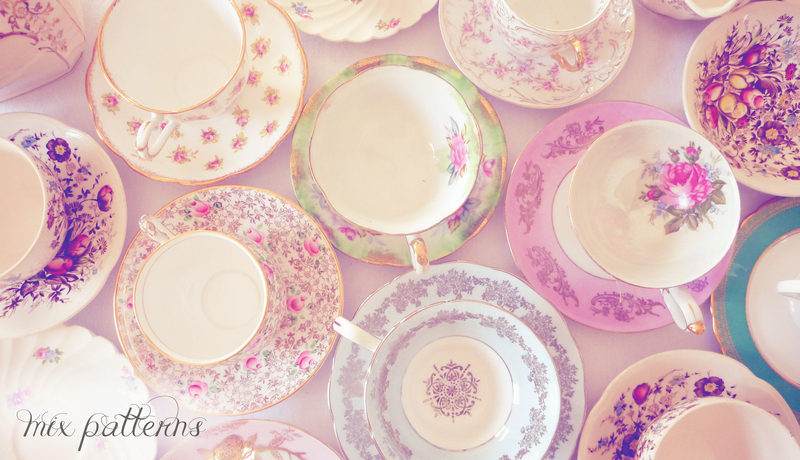 I need to get a lot more teacups first but how pretty yours look really inspire me to look a lot harder! I’m so glad to hear it! Just keep your eyes open for them when you’re out and get a few at a time. You’ll be surprised how many you have within a year. Happy Hunting! I’ve seen some fantastic ones where people have turned them into candles as well which is definitely something I’d like to try! LOVING THESE FINE CHINA PICKS! YOU CAN FIND GREAT CHINA IN SECOND-HAND AND ANTIQUE STORES.